Trucking is an integral part of our modern economy. After all, the products we buy and use have to be transported from Point A to Point B, and a large portion of that transportation is done with trucks. 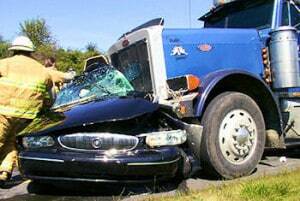 However, trucks are large, hard to maneuver, and hard to stop, and these facts make trucking accidents particularly dangerous. The vast majority of truck drivers are trained professionals who are safer drivers than the average motorist on the road. That said, trucks are difficult vehicles to drive and their mechanical complexity renders them more vulnerable to disrepair and resultant accidents than regular vehicles. One of the most common causes of trucking accidents is driver fatigue. If you have been injured in a trucking accident and you suspect that it was a result of a fatigued driver who should not have been on the road, you may be entitled to compensation. The truck accident attorneys at Slappey & Sadd have extensive experience representing clients who were injured by fatigued truck drivers. We will evaluate your case and work on your behalf to obtain the compensation you deserve. We serve the entire state of Georgia, including Decatur, Lithonia, and Marietta. Truck drivers are limited in the number of hours they can drive at one time. The Federal Motor Carrier Safety Administration (FMCSA) sets national hours-of-service rules for truck drivers that require them to take periodic breaks from the road. These regulations are set to protect the driver from fatigue and exhaustion. Under these rules, truck drivers are allowed to drive a maximum of 11 consecutive hours – after taking 10 consecutive hours off. Further, truckers cannot drive beyond the 14th hour after going on duty following a 10-hour break, cannot drive for more than 60 hours in one week, and cannot drive for more than 70 hours in eight days. Additionally, truckers can only drive if eight or fewer hours have passed since the end of the driver’s last off-duty or sleeper berth of at least 30 minutes. As you can tell, these rules are very specific and, unfortunately, not all truck drivers and trucking companies observe them as closely as they should. Fatigued driving poses a danger to both the fatigued driver and to other motorists on the road because it can cause a loss of focus on the driving at hand – or even a loss of consciousness. Fatigued driving is also alarmingly common. The National Sleep Foundation finds that 60% of adult drivers say they have driven a vehicle while feeling drowsy and that more than a third of adult drivers have actually fallen asleep at the wheel. The National Highway Safety Administration also estimates that about 100,000 crashes per year are the direct result of driver fatigue, which amounts to an estimated 1,550 deaths, 71,000 injuries, and $12.5 billion in monetary losses. Trucking companies bear the responsibility of ensuring that their drivers comply with federal hours of service violations. They do this by scheduling their drivers’ routes in accordance with hours-of-service limitations and by ensuring that their drivers actually stop driving when they are supposed to. If there is evidence that a trucking company is consistently over-scheduling its drivers or is not properly monitoring the number of hours they spend on the road, the company can be held liable for any accidents their drivers cause. Our experienced truck accident attorneys at Slappey & Sadd will evaluate your claim, gather the necessary evidence, and, if it appears that the trucking company was at fault for the accident caused by their fatigued driver, will begin the process of seeking just compensation through a personal injury lawsuit.